Because Spanish train tickets on Loco2 come directly from the rail operator, they often include lots of information in Spanish. We've created a guide in English to make it easier to understand your Renfe tickets and included other useful words and phrases for travel on the Spanish rail network. Your ticket type varies depending on whether your trip is a Renfe-SNCF journey (e.g. the Paris to Barcelona TGV) or solely a Renfe journey (all domestic Spain journeys, and trains between Spain and Portugal). We've included details of both. Note that Renfe for tickets for travel within Spain don't include passenger names. Each ticket may be used by any member of your travelling party, so long as the passenger type is correct . The "Localizador" number is your Renfe order reference, and your PNR (Passenger Name Record). This holds information, specific to you and your trip, in a format that can be read by all carriers (not just the ticket issuer). 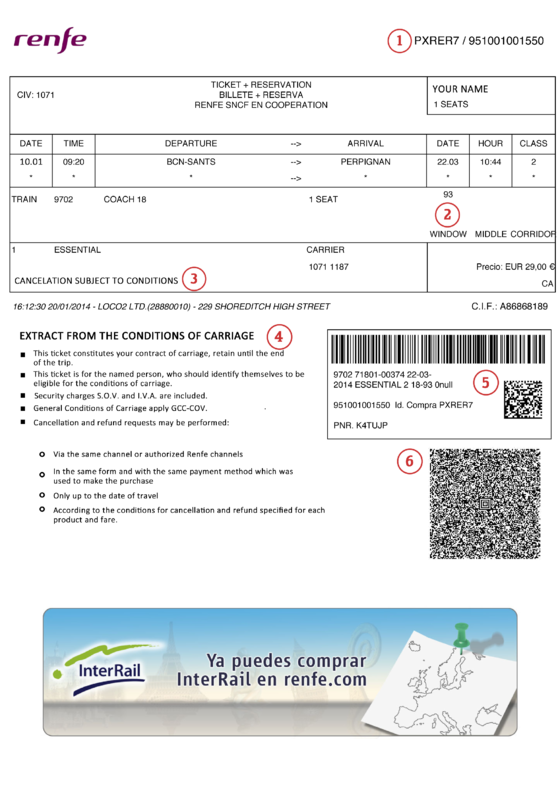 The CombinadoCercanias password printed on most Renfe long-distance tickets can be used to obtain local transport on the Cercanias/Rodalies network around cities in Spain. See Free transfers from Renfe - Combinado Cercanías for more information. Refer to the confirmation email or your Loco2 account for the fare conditions associated with your order. For domestic trains your seat number is shown as “plaza”. Seat type (window/aisle) is not normally shown. Important information about the conditions of carriage. In particular you should note that e-tickets are non-transferable i.e. only the named passenger, who may be required to show identification on demand, is eligible to travel. 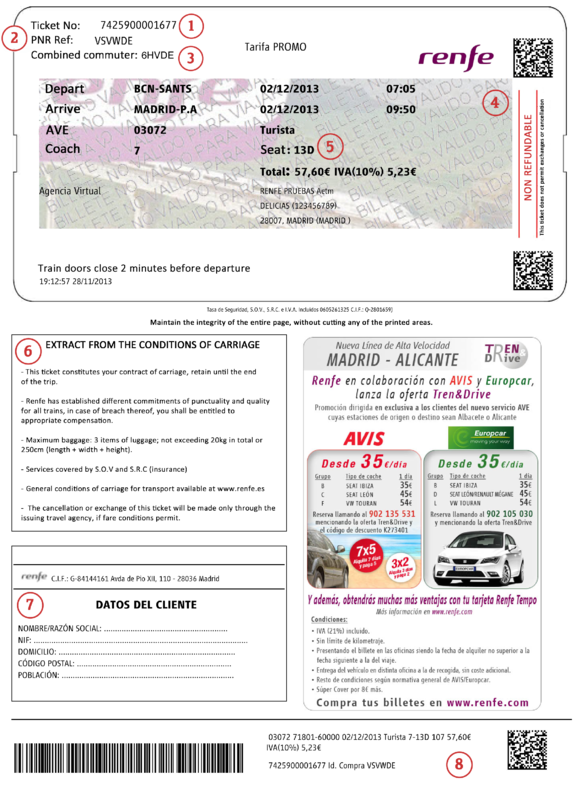 The section for Datos del cliente ( Client details) on domestic tickets is typically used by Spanish business people to validate tickets (as proof of travel for accounting purposes). Leisure travellers are not required to enter any details here. The barcode or QR Code will be scanned by the ticket inspector on board the train to validate your ticket. Please make sure this is clearly printed before travel. Renfe-SNCF is a collaboration between the Spanish and French rail operators, offering tickets on international high-speed trains between France and Spain, for example on the popular Paris-Barcelona route. Tickets for Renfe-SNCF are slightly different from domestic Renfe tickets. Your Renfe order reference and ticket number. These are different from your Loco2 order number, which starts “LO-“. For international trains your seat number will appear in the column above the corresponding seat type e.g. Window/Aisle. For domestic trains your seat number is shown as “plaza”. Seat type (window/aisle) is not normally shown. The Passenger Record Number (PNR) holds information, specific to you and your trip, in a format that can be read by all carriers (not just the ticket issuer). 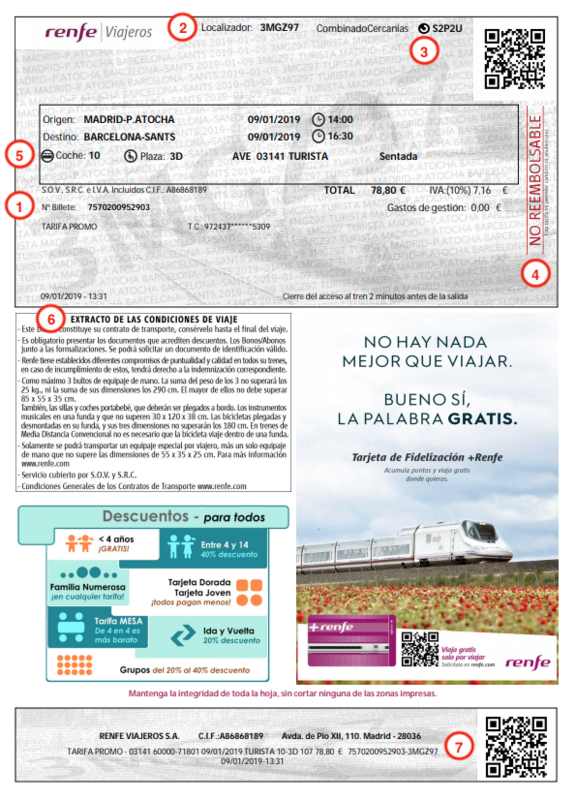 Note that the PNR on domestic Renfe tickets is the same as the Renfe “localizador” number (see note 1).